Raspberries in late summer and autumn. I noticed a few a tints of autumn colour on my raspberry plants. Normally an unnoticed clump three meters long, two thirds of a meter wide, runs alongside the fescue-grass path across from my vegetable garden. Next to a shrubby honeysuckle (Lonicera purpusii), a few irregular asparagus plants and surrounded by self sown parsley and Nemophila ‘Penny Black’, it just merges into the ornamental garden. It does have aggressive spreading suckers. The mower takes care of most of these and the others I routinely yank out. We don’t get particularly high yields. Every second day I stroll up the path with a small pot and pick thirty or so ripe fruits. That’s sufficient for evening dessert each night for at least 3 months. I can expect fruiting from mid August to mid November. The birds do not to take them.This might be because the fruits are protected by foliage. No staking is required. Although I probably should thin them a little, I don’t! I do restrict them to their designated space. There is no skill to pruning - they are just chopped to the ground in late autumn/winter. That’s just five minutes work with my hedge trimmer. Raspberries grow well if given generous nutrition. If I remember, the whole clump gets a handful of NPK fertilizer in late February or March. Roots are then active, and natural soil nitrate is low at that time. Some winters I mulch the cut back stems with a couple of bags of manure. (If I get there first, free bags of manure are at a village garden gate.) I do get resistance from a certain quarter to carrying manure in the back of the car. Unfortunately the manure also provides me with an unwanted reminder of agricultural weeds. Raspberry plants do not last forever, they eventually accumulate virus disease. My plants are six years old and are still looking good. When I eventually have to replace them (and plant on a new site), I might give new varieties ‘Joan J’ and ‘Polka’ a try. 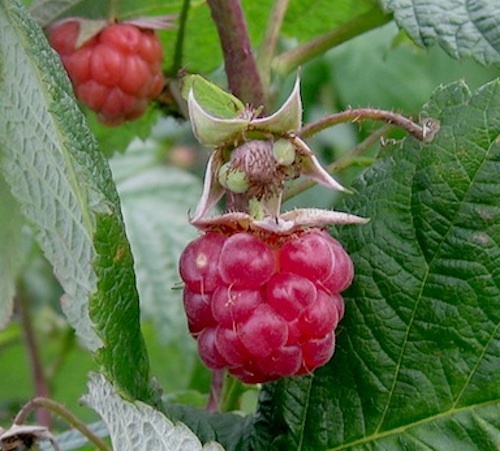 I have recently read about double-cropping of autumn raspberries to extend their fruiting season.This involves not cutting them back to the ground in autumn, and pruning out old shoots in summer. I will give it a try next year on a portion of my clump.